Having a themed birthday party does not have to be expensive! 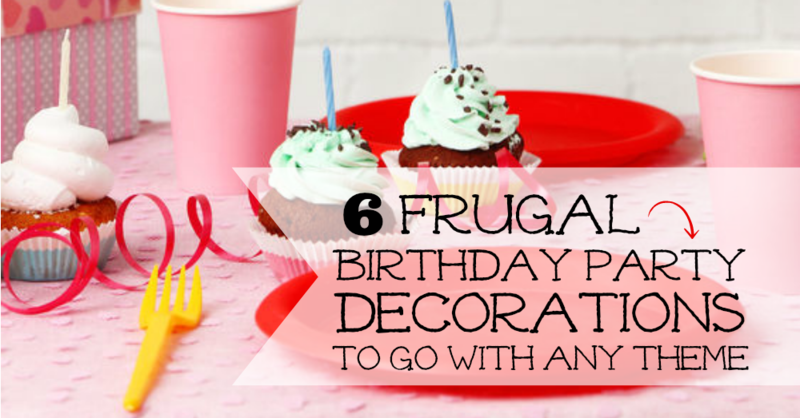 I wanted to share some of my top tips for frugal birthday party decorations. 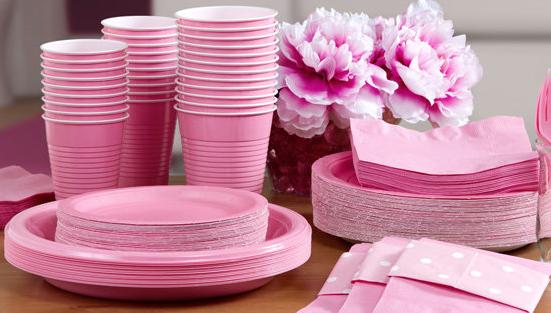 We have all done it, our kiddo wants a themed party, like Barbie or Superman, and so we go and buy Barbie or Superman plates, napkins, cups, etc. I made that mistake one time. Don’t do it!! You will save SO much money if you simply buy plain colored plates and napkins to match your theme. Having a Barbie party? Buy pink and white items. Superman? Red and yellow. We had a Nerf Battle party, so I bought orange and blue. Colored plates and napkins are not only cheaper, but they will really make your table pop with color. My favorite place to shop for paper goods is Dollar General and Dollar Tree. Speaking of Dollar Stores… Dollar Tree is usually my first stop when it comes to gathering my party decor. 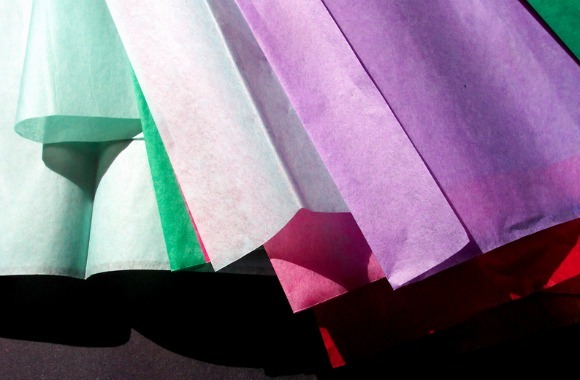 Not only can you find cheap, colorful paper goods, you can also find things like balloons, crepe paper, tablecloths and tissue paper. Items at the Dollar Tree and Dollar General are much cheaper than if you’d buy them from a party supply or hobby store. I love using crepe paper to decorate for parties! Crepe paper is cheap and it is so fun to play around with. You can get colors to match your theme and just add traditional type streamers or you can go all out and create fun decor with it. Take for instance my Spider I made for a Halloween party. You could make this spider for a bug party or a Minecraft party. You could also change the colors up and make an octopus or other creature. Be creative! I love this simple crepe paper party backdrop. This backdrop includes two of my favorite decorating tools – crepe paper and balloons! If you have a little ball player at home, that little statement is funny to you. If not, just ignore it. I’m surrounded mostly by boys, remember. 😉 Anyway, back to the balloons. Balloons are such a fun and easy way to decorate. You can purchase balloons at one of the dollar stores (though sometimes the quality isn’t terrific). If you have multiple items to purchase online, you can find high quality balloons on Amazon. Helium is expensive and hard to come by right now. 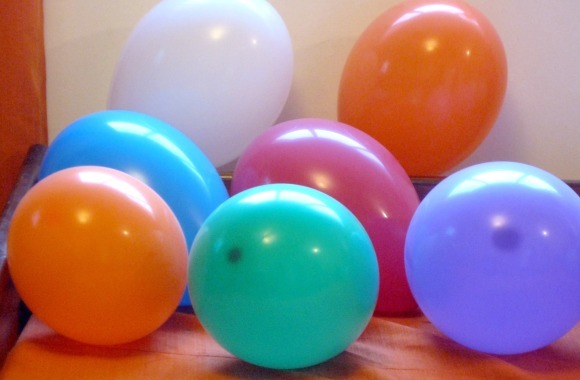 Don’t worry about filling your balloons with helium. There are so many other great ways to decorate with balloons! I love this hanging idea. You don’t have to hang them all from one place either. Balloons are fun to hang from the wall or light fixtures. I have also been known to just thrown some blown up balloons on the floor around the party area. Kids love balloons (the more easily accessible, the better). Tablecloths are not just for tables! They are great for decorating with. You can find a variety of colors of tablecloths at the dollar stores. They only cost about $1 each so they make for a cheap decoration, too. I have used tablecloths as backdrops to food tables or photo booths. I really love this braided backdrop idea. If you want to really go all out with your table decor, why not make this ruffled tablecloth? Isn’t this so pretty? Since tablecloths are so big, they can make a huge impact on your party decor. I cannot tell you how many times I have made pom pom balls from tissue paper. Pom poms are great because they can be made in a variety of sizes and colors. You can see an example here for my niece’s Frozen Birthday party. Have you seen the tissue paper numbers? These are really cute, too. You can do a number for the birthday or even a big sign with the party girl or boy’s name. There are so many options here, and they are all so inexpensive. 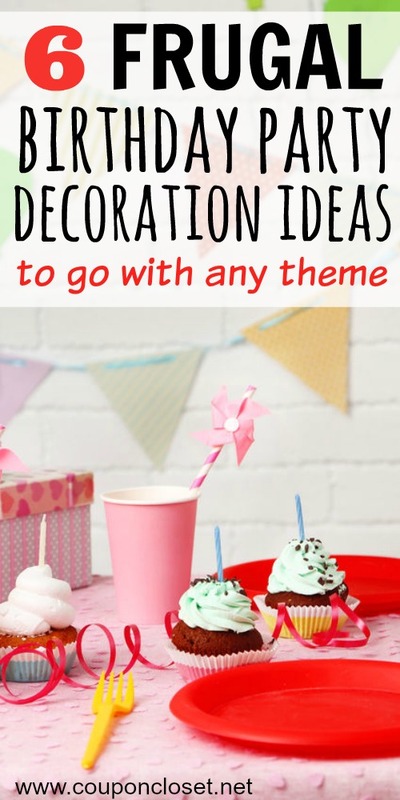 Do you have some favorite frugal party decoration ideas? We’d love to hear from you. Which of these frugal decorating ideas have you tried before? Which do you think you’ll try at your next birthday bash? Drop us a line and let us know. Happy party planning! If you are throwing a graduation party, we have a ton of Graduation Party Food Ideas that are easy to prepare, budget friendly and incredibly tasty. How to Save on Car Insurance – 10 Ways to save money!